The humble onion is the backbone of most cuisines. It is the basis for a variety of stocks and sauces, essential for flavour, giving both acidity and sweetness. Onions can be pickled, roasted, caramelised, used in chutneys soups and purees. Onions come in many shapes and sizes, all hailing from the alium family which also includes shallots, garlic, leeks and chives. Common types of onion found in the UK are brown, red, pearl, roscoff and white. Always look for firm onions with unblemished skin. 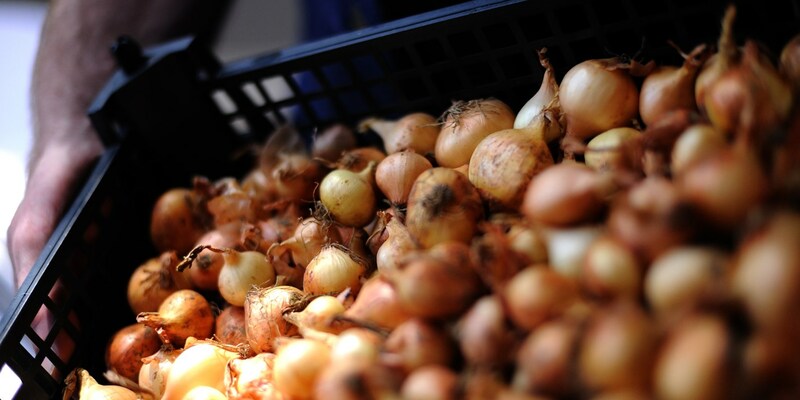 Onions can be kept in a cool dark place for up to two weeks. The most common preparation of brown or Spanish onions is to dice and sweat at the beginning of a dish. Dice the onion and add a little oil or butter to a pan over a medium heat, add the onion and cook without colour until soft. These onions can be used as the base for soups, curries, pasta dishes and much more. To make caramelised onions for gravy or chutney, slice the onions very thinly. Add to a pan with a little oil and cook gently for 20-40 minutes (depending on the quantity of onion you have) until a dark brown colour is achieved. Don’t add salt to the onions as this will draw out moisture and prevent them from caramelising. Although normally used as part of a dish in a chilli, shepherds pie or tagine to name but a few, onions have almost limitless possibilities, onion tart, consommé and soup all show off this sometimes overlooked vegetable as a main ingredient of a dish. Paul Foster pickles onions in beer as a delicious accompaniment to a salad or light meal. Alfred Prasad uses them to make a spicy Onion bhaji while Kevin Mangeolles makes a tasty Onion bread. Onions give acidity to Colin McGurran's onion and marmalade chutney and are slow cooked and sweet in Adam Byatt's Beef and onion cottage pie.